Hibachi Hut entrance. Photo courtesy Hibachi Hut. Located in Aggieville! Photo courtesy Hibachi Hut. "Chicken Orleans" Photo courtesy Hibachi Hut. 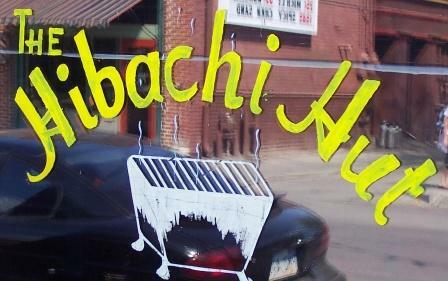 The Hibachi Hut closed on May 26, 2013. A new owner has purchased the restaurant and recipes from the owners and will relocate to 429 Poyntz in downtown Manhattan. They hope to be open the first part of December, 2013. The menu will be mostly the same with a few tweaks. The Hibachi Hut is a finalist for the 8 Wonders of Kansas Cuisine because since 1959 it has been a mainstay in Aggieville and is famous for their Cajun/Creole and American specialties! The Hibachi Hut is a Cajun/Creole and American casual dining restaurant. Our in house cooking, unique recipes and friendly service have provided memorable experiences since 1959. In addition to Cajun/Creole, the Hut also has selections including: seafood, pasta, steaks, sandwiches, salads, and soups. Some of the favorites are Tiger Wings, Red Beans and Rice with cornbread, Chicken Orleans, Blackened Chicken Parmesan and Cajun Feast. USDA Choice Steaks are served cooked to perfection. Seafood Specialties are always available including Crawfish Etouffee with Blackened Catfish. A tradition is the Belly Bomb Hamburger. Homemade Soup and Gumbo are always a treat. There are other sandwiches available including the "Po Boy" sandwich--a New Orleans tradition. Top off your meal with our homemade bread pudding with whiskey sauce. You will soon see why a meal at the Hibachi Hut has been a Manhattan tradition since the 1950's. During the spring months, The Hut features Seafood Fridays--during that period, at least five specials each day feature items such as Grilled Swordfish, etc. When the Hibachi Hut (commonly called The Hut) opened, food was cooked on a hibachi grill (a small grill). A painting of a hibachi grill (completed over 40 years ago) is still located on the front window of The Hut. Located in the heart of Aggieville, The Hut has been a tradition in Manhattan for 49 years. The decor of The Hut has not changed much over the years. The photo in the back of the Hibachi Hut has been a favorite of patrons for many years. The photo is a picture of Avery Island, "The home of world-famous TABASCO Sauce". The Hibachi Hut has hosted a Fat Tuesday Celebration for many, many years. In a festively decorated Mardi Gras atmosphere, the bountiful buffet has: Frog Legs, Alligator Piquant, Oysters on the Half Shell, Shrimp, Shrimp Etouffee, Gumbo, Shrimp Boil, and many other Cajun favorites. Hibachi Hut was opened in 1959. The first owners of the Hut were Margaret Harensharr and John Anderson. The next owner was Charlie Bush. After three years, John Heritage became the new owner. He owned the restaurants until July 1, 2004, when the Beckers (retired educators) purchased the restaurants. The current owners are Bill Becker, Sandra Becker, Kale Becker, Marc Claas, and Ryan Beran. The building has changed some over the years but the biggest change was the opening of its sister restaurant, Texas Star Cafe (specializing in Tex-Mex, BBQ, and Chicken Fried Steak and Chicken Fried Chicken), in the early 1980's on the south side of the Hut location. 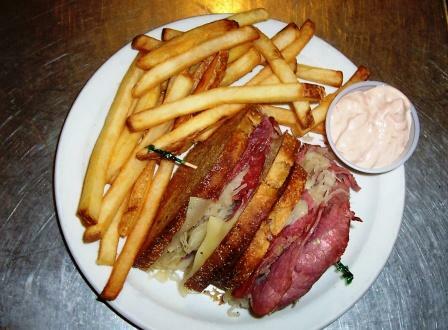 Get a load of that Reuben! Photo courtesy of Hibachi Hut.